When you decide to want to launch a career in pop music, why would you want to keep your identity a secret? The first one I remember personally was in 1980 when I was given an album called Children of the Night which had a worrying looking sleeve. It showed a man in a white suit and white top hat walking out of an underpass-type road tunnel with three children by his side – two of them holding this man’s hand, the artist was credited to Nash the Slash. I remember asking the promotions man who handed me the album who Nash the Slash was, he said, ‘it was a secret’. I tried to dig for information and was told, by a quite unreliable source, that it was Gary Numan in disguise and I remember thinking, why? He’s just made a name for himself, why take on a non de plume? His on-stage image was to be covered in bandages and play an electric violin. I thought, well that probably rules out Gary Numan. It wasn’t a bad sound, but, despite releasing a total of 11 albums it’s fair to say he never became a household name. Years later I did discover that it was someone called Jeff Plewman, a Canadian who had been creating his unique concept of sound and vision for over 20 years. His moniker came from a killer butler as encountered by Laurel and Hardy in their 14th film Do Detectives Think? in 1927. Anyway, some 14 years prior to him an act called ? 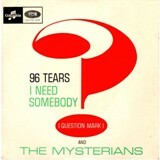 And the Mysterians managed one UK hit with the song 96 Tears and the man who decided to use an eroteme loved the idea of being shrouded in mystery. Let’s unravel the pieces. The line-up at the time of the hit in 1966 was ? (vocals), Bobby Balderrama (guitar), Frank Rodriguez (keyboards), Frank Lugo (bass) and Eddie Serrato (drums). It was only years later that ?’s identity was revealed and we’ll never know what made his decided to reveal all. He was born Rudy Martinez in Mexico and raised in the Saginaw Valley in Michigan. In 1962 Rudy wrote a poem called Too Many Teardrops which he did nothing with for a couple of years. When he put the band together in 1965 it was them who set the poem to music because Rudy didn’t read or write music. Bobby Balderrama said, “Eddie suggested they call the song 69 tears because it would be different and more interesting to have the number of tears that had fallen. The band thought the song could be banned from radio airplay with that title so Eddie suggested 96 Tears, a simple reversal of 69. Everyone agreed and the rest is history. They started doing some local gigs and their first regular slot was at Mount Holly Hall where one fan, Lilly Gonzalez soon became their manager. Rudy said of the song, “I never wanted to record it in the first place but we had a lot of fans that wanted the record, but, nobody wanted to record us. Eventually Lilly set up her front living room into a makeshift studio which is where the band recorded two songs, 96 Tears and Midnight Hour. Once she’d moved most of her furniture out of the living room it created an echoey sound which gives the song its unusual sounding acoustics. Lillian Gonzalez initially manufactured only 500 records and told the guys to start promoting it. According to the author Mark Guerrano, ? and Bobby then sent 100 postcards to the station with made up names and addresses requesting 96 Tears. This brilliant marketing move got them more airplay and local stores where ? and Bobby had already placed records started to sell them. Eventually the local station gave it more airplay and it went to number one in Flint’s local chart. Eventually the record got picked up by CKLW in Detroit, where it became number one and that’s when Lilly and the band realised they needed national distribution. Offers came in from several record companies and they went with Cameo-Parkway but they soon learned that the label couldn’t afford to promote it properly. Allen Klein, of Rolling Stones and the Beatles fame, bought the rights to many of the company’s recordings and kept the artist’s under their original contracts. The song eventually topped the Billboard Hot 100 singles chart in October 1966, but stalled at a lowly number 37 in the UK – probably due to lack of promotion. The trouble is, Allen was typical of many label managers and publishers back then and never paid the artists their rightful money so ? had to re-record the song to be able to make some money, but they never quite captured the sound you heard of the original. The song has been covered many times by artist which include Big Maybelle, Todd Rundgren, Bruce Springsteen, the Inspiral Carpets, Aretha Franklin, the Stranglers and Iggy Pop. ? is now credited with starting the punk movement because of his unassuming characteristics and very basic chord structures. “All my songs are profound, they’re never personal,” ? said. “When you explain your songs, you can’t make it your own song anymore. Look at Every Breath That (sic) You Take, everyone thinks it’s a love song and Sting came on VH1 and said that it’s not a love song. If you listen to the lyrics, it’s about big brother looking at you. But, he destroyed it. It’s not your song anymore. It belongs to him and he wants people to know what it’s all about, but he should have done it from the beginning, but not let people carry on and then all of a sudden drop a bomb on them. After the band’s success, Rudy Martinez legally changed his name by deed pole to ? – the symbol not the words (is this where Prince got the idea we wonder?). In interviews he insists on it and still says he’s from Mars. He also still wears the same wraparound sunglasses when he’s anywhere the public will see him. The band are still performing, but never like to stray too far from their native State. Even more surprising is that they still have the same line-up with the exception of Serrato died of muscular dystrophy in 2011 and was replaced by Rudy’s brother Robert Martinez.